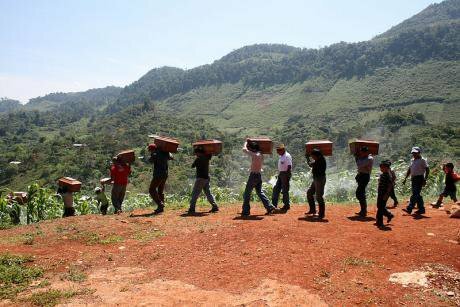 Queqchí people carrying their loved one's remains after an exhumation in Cambayal in Alta Verapaz department, Guatemala. Since 1997, the Centre of Forensic Anthropology and Applied Sciences (CAFCA) has been helping to heal the deep wounds caused by Guatemala’s internal conflict. The impact of CAFCA’s forensic work is twofold: It helps families to find their loved ones and come to terms with their loss and it gathers the evidence needed to bring their murderers to justice. Photo: CAFCA archive. The Historical Archive of the National Police in Guatemala (AHPN in Spanish), discovered in 2005, is a repository of up to 80 million police records dating as far back as the late 1800's. Many of these documents have served as vital evidence in cases relating to crimes committed during Guatemala's 36 year internal armed conflict. The future of the archive, however, could be in jeopardy. In a press release dated the 5th of August the UNDP office in Guatemala announced the finalization of the AHPN's director's contract. Gustavo’s Meoño has been director of the institution for 13 years. The announcement, made on a Sunday came without warning to either Meoño nor the 52 staff working at the archive. Two days previously, on Friday the 3rd of August, a delegation from the Ministry for Culture and UNDP arrived at the archive and requested Meoño to leave the premises without prior notice. UNDP have administered the archive's funding, from the UN and other international donors, since 2009. Nevertheless, a direct intervention of this kind in the internal management is unprecedented. It follows months of delays from the Ministry of Culture in signing staff contracts, despite the availability of funds. The UNDP press release states that management of the archive will now come under the direct responsibility of the UNDP office in Guatemala in collaboration with the Ministry for Culture. UNDP and the Morales government have proceeded with so little transparency. Certainly the press release issued by the UN Development Program office following Gustavo Meono's removal contained no useful information or explanation. The discovery of the archive was an accident of history. In 2005 a a military arms deposit in the east of Guatemala City exploded, prompting the Human Rights Ombudsperson's (PDH) office in Guatemala to carry out an inspection of other arms deposits in police and army barracks around the city. This led them to an almost completely abandoned barracks in the far north of the city. The Zone 6 police station, though originally intended to be a hospital, was an infamous clandestine detention and interrogation centre during the armed conflict. As the country moved towards the reestablishing democracy and the signing of the peace accords in the1990's, it was let fall into abandonment. When the staff from the PHD stumbled upon this warehouse they realised the significance of the documents and filed for an immediate judicial protection order. Both the Guatemalan police and military are notorious for their reluctance to hand over files relating to the internal armed conflict. Over the last 13 years a team of dedicated researchers and archivists have worked on cleaning, restoring, sorting and analysing the documents. They have managed to restore and process 21% of the archives,some 23 million documents, prioritizing documents relating to the worst years of Guatemala's political repression and internal armed conflict. Many of these documents evidence extended periods of surveillance of prominent political figures, social activists, union organisers as well as details of arbitrary detentions, torture and murder. Once the documents have restored, analysed and catalogued a digital copy is made and a back up is stored at the University of Texas. The APHN has provided vital evidence in the prosecution of many perpetrators of crimes during the internal armed conflict, including the recent Molina Theissen case which resulted in the sentencing of four high profile military officers for the detention and torture of Emma Molina Theissen and the forced disappearance of her 14 year old brother Marco Antonio in 1981. The documents are available on request to members of the public and have become a key resource for families of Guatemala's missing, disappeared and murdered trying to trace the last known whereabouts of their loved ones or evidence of what happened to them during their last moments. The decision on the part of the UNDP and the Ministry for Culture, comes at a time when the Guatemalan government has been taking concrete steps to reverse much of the progress made over the last five years in terms of tackling corruption, reducing impunity and addressing crimes of the past. Since 2017 the president, Jimmy Morales, once again facing a request to rescind his immunity for corruption and illicit electoral financing, has made a number of attempts to alter and restrict the mandate of the International Commission Against Impunity (CICIG). In August of last year Morales declared Iván Velásquez, head of the CICIG, persona non-grata and requested his immediate removal from the country. In fact President Morales declared Friday 31st of August that they would not be renewing the CICIG’s mandate, which expires in September 2019. The announcement was followed by protests in Guatemala City throughout Friday and Saturday. The Minister for Foreign Affairs, in a public Statement on May 10th this year, notified the Swedish Ambassador, Anders Compass, of a 30 period in which to leave the country as a result of his alleged interference in national affairs. Up to 18 human rights defenders have been murdered between January and July 2018. Most of the assassinations relate to defenders of land and natural resource rights and those murdered were members of two of the country's largest campesino organisations, CCDA and CODECA. Meanwhile up to 18 human rights defenders have been murdered between January and July 2018. Most of the assassinations relate to defenders of land and natural resource rights and those murdered were members of two of the country's largest campesino organisations, CCDA and CODECA. The national Congress reconvened on August 1st, following the summer recess, with an congressional agenda includes a law to restrict the activities of national and international NGOs and civil society organisations, a so-called 'anti-terrorist' law, reforms to the electoral law and changes to the amnesty law aimed at ensuring impunity for crimes committed during the internal armed conflict. UNDP has justified Meoño's dismissal and the restructuring in terms of the beginning a new funding cycle under the UN Peacebuilding Fund. Nearly three weeks have passed since the announcement and Meoño said he has had no further explanation from UNDP regarding the abrupt termination of his contract. Meoño expressed concerns for the remaining 52 staff members, many of whom have worked their for years, who were granted contracts for a further five weeks only. He also said there has been no clarification as to the position of 24 more staff members who have been contracted under projects by other funders to investigate the criminalization of women, forced disappearances and extra judicial tribunals. Remaining staff at the archive were unwilling to go public with comments due to the sensitivity of the situation. With the archive playing a key role in a number of onging investigations related to the internal armed conflict, including the Caso Diario Militar and the forced disappearances of 43 union member from the Central Workers Union in 1980, it has long been considered a stone in the shoe of those who would prefer to keep crimes of the past buried. National and international civil society organisations have called on the Guatemalan government and UNDP to take the appropriate measures to ensure the integrity of the archive and to clarify the future of the management and team. The National Security Archive have launched a petition directed at government authorities, highlighting the unique nature of the archive and it's importance in relation to documenting the activities of State security forces throughout the 29th century in Guatemala. UNDP have given no further public indications as to their plans for managing the archive and ensuring the safety and integrity of the documents, and were unavailable for comment at this time.